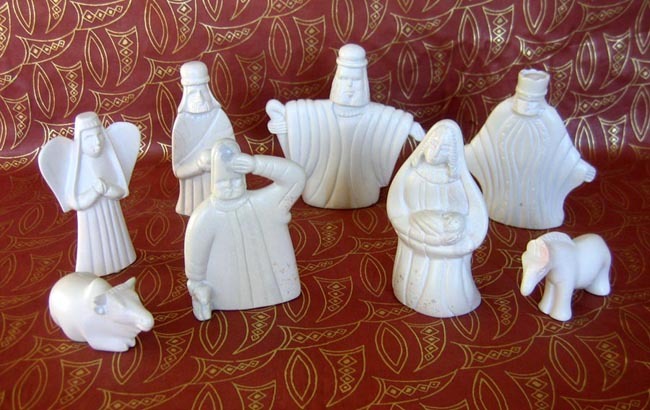 This Nativity was hand-carved from Kisii soapstone. The set was carved by a group called Nyabigena Soapstone Carvers in western Kenya. The 8 detailed stylized figures include: Mary holding baby Jesus, Joseph, an angel, a horse, a zebu cattle with hump on its back, and three wise men. The tallest figures measure 4.5 inches tall. Kisii, a city in western Kenya near Lake Victoria, is surrounded by soapstone quarries and is well-known both for the quality of its soapstone and the skill of its carvers. Nyamarambe, a small village near Kisii, is the home of the 150 member Nyabigena Carvers Cooperative. Since export sales for this cooperative dried up in 1999, the 150 members have worked hard to find new markets for their carvings. With no paid staff, the board members take turns handling the various jobs which need to be done. This civic-minded cooperative has sponsored a women’s literacy program, HIV/AIDS awareness programs, a program which supports school dropouts to encourage them to finish school and thus avoiding the necessity of child labor. A recent source of great pride for the cooperative is the new elementary school in Tabaka which opened in January 2007 and is now educating 71 students, thanks mostly to the proceeds from the sales of soapstone crafts.